Aloe vera and other aloe plants and how to care for and use them. Aloes are historically linked to the ancient Egyptians (1500 B.C.) and the Bible speaks about Christ&#8217;s body being wrapped in aloes (John 19:39 ), after he was removed from the cross. 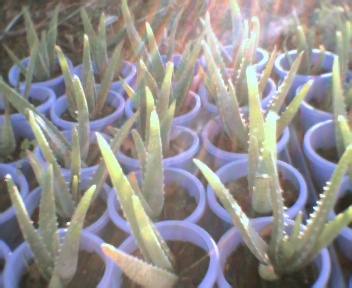 The Jews learned of the healing powers and cosmetic qualities of aloes, while they were held in captivity by the Egyptian Pharaoh. Cleopatra was known to have used aloes to preserve her beauty for Mark Antony. 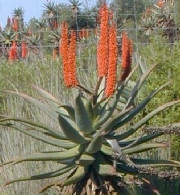 Aloe ferox is a lovely succulent with medicinal properties. It is native to South Africa. These aloe plants will be 3 feet tall in maturity. The leaves are a light green. They may also have a reddish or bluish tinge. Flowering occurs in spring or autumn. The blooms are candelabra of tubular orange or red. The flower may have 5-10 branches and the individual flowers are densely packed in thick clusters on the stalks. This beautiful aloe forms a display and attracts many bird species. It is an excellent garden specimen plant and is adaptable to many conditions. The gel-like flesh from the inside of the leaves is used in cosmetic products and is reported to have wound healing properties.